After much debate, controversy, protests and plans, with some testing too, the new top level .gTLDS (as they are properly called) are coming in early 2014, with continuous roll outs of up to one thousand dot names during the first wave alone. 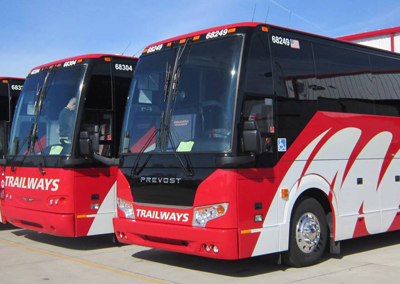 Trailways bus company has jumped the gun and in a very clever move named its Facebook page Trailways.Travel. Plus it is painted on the back of many of their busses. Since Trailways is a big and properly protected trademark, only they should be able to register for the trailways.travel domain so there is minimal risk for them. Do an inventory of all your present company domain names and decide which ones to keep and which ones to allow to expire. Check the contact information on all your domain registrations to make sure it is current and that all employees listed, and their emails, are still correct. Check where all your existing domains are pointing. If not actually live, do they provide your potential clients with some directional information, or do they automatically forward to some other live website of yours. Review all the new domains coming. Most of those relevant to the US market can be found on GoDaddy.com or OneAndOne.com. Flag those you want to keep an eye on, including potential new ones. Make a separate list of these, and provide it to he rest of management for consideration and feedback. Note that just like the present domains, you may not qualify for all of those you desire. For example, right now if you are in the cat food business, you cannot claim a .cat domain unless you have an office in Catalonia (Spain). So expect to have to prove you are a college to get a .college domain and you are a hotel to get a .hotel domain. If you are a very brand-centric business, consider adding your key registered trademarks to the new International Trademark ClearingHouse right away so there is no doubt during the “sunrise” period about your worldwide claims and protection. Note these must already be trademarks registered in some country, the EU, or protected by a proven court of law action. Designate someone to be responsible for monitoring and procuring the new domains you are interested in, as well as a process for updating all concerned teams. Such person should monitor ICANN.org, DomainNameWire.com and other informational sites and blogs such as this. Follow me (@namiac) on Twitter to get regular updates too. Keep your I/P lawyer in the loop. There are some potential big trademark issues and rights at stake here. If you do not yet have a registered trademark on some of your top brands, starting with your company name and key product brands, use this as your justification to spring into action. Now it is very very clear that trademark law will define all the domain fights that erupt in the future – even as they do now. For international businesses see about filing more trademarks in your major sales territories – some of these new domains are specifically for foreign business registration (for example .gmbh domain, as well as a number in Chinese, Japanese or other foreign character sets. I have a new business name. Now what? 9 Steps to file your own trademark.